Rose petals, romantic music, soft light and dozens of scented candles to decorate the room - banal, but mandatory attributes for an unforgettable romantic evening with your beloved. Romance obsesses the evening, passion raging and you're over the moon with happiness, until suddenly you see how candle wax drip on the carpet. Your mood goes bad and instead of gentle emotions, you are required to clean. Paraffin on floor, wax on the carpet or chewing gum on the furniture – this is nightmare of every housewife. Wax on the floor is not only a result of negligence during a romantic evening. Incidents with domestic paraffin candles occur permanently at people’s homes. 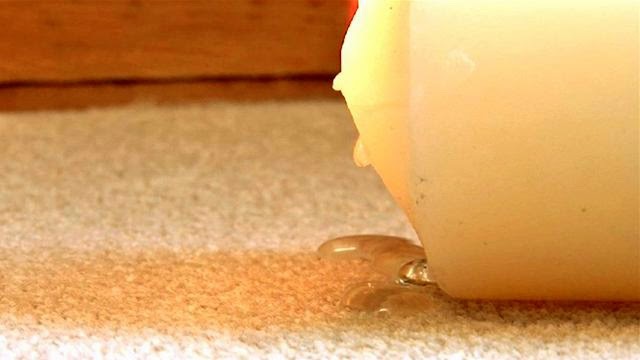 Let the wax out of carpet: Organic, small, large, fragrant - no matter what type of candles you prefer to light, they are all made of wax, and it is often detrimental to household items. If you have a wax stain on the carpet, take a cotton cloth and fold it to several layers. Put a heated iron on it. Wait several seconds; remove the iron and the cloth. If all goes well, the wax must have been stuck on the cloth. Wax or paraffin on the floor: Here things are even simpler. If the floor is tiled or laminated, just scrape off the stain. Chewing gum on the couch - Priceless! Situation with chewing gum is the similar as wax. First, identify what is the affected material. Freeze the chewing gum, until it gets hard. Gently scrape it from the surface. Slightly wash the surface with a cloth previously dampened in soapy water. Rinse well and dry the area. Polishing: After washing the stains, it is desirable to polish the surface (if it is laminate or wood furniture, for example). Polishing with detergent or natural ingredients (mixture of citric acid and olive oil) give a natural appearance to the surface.